Well, pies are the best, too. But I've never seen a naked pie. But oh, those naked cakes. And this is a good time to talk about them. With Thanksgiving and all its pies now past, and Christmas on its way, we can shift our thinking to other delights-naked cakes, for instance. They're one of my best entertaining secrets-a show-stopping dessert to end the evening. 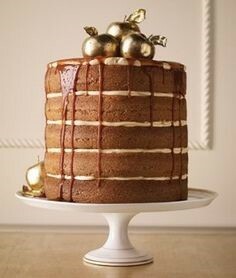 And nothing beats a beautifully decorated layered cake as a centerpiece. You get all that with a naked cake, without the stress of completely frosting a cake and decorating it. It's a simple stacking of cake layers with luscious filling between each layer. Your cake ends up with a rustic and relaxed feel to it-a most approachable cake. Approachable because it suits all tastes. Some folks (believe it or not), don't care that much, if at all, for frosting. So this cake is for them-no frosting to scrape away to get to the actual cake. But for the folks that love the frosting, there's the luscious filling that substitutes perfectly well for the missing frosting. 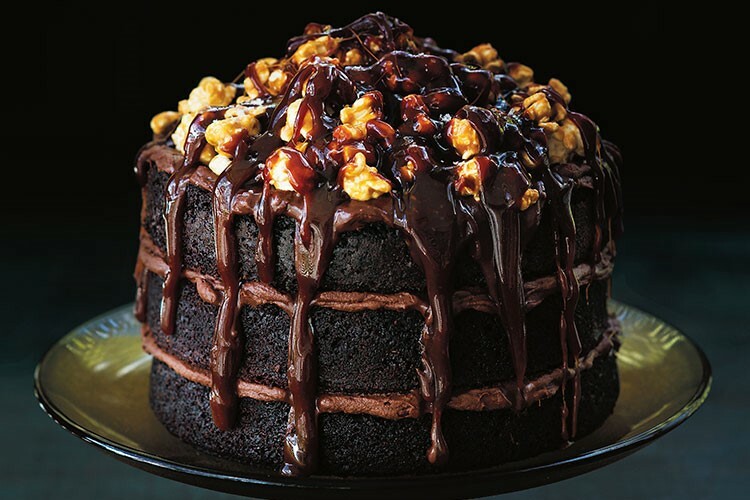 And finishing the cake off is the show-stopping sauce or glaze that's poured over all the filled cake layers. There's an artistic and professional presentation that results when sauces or glazes are dripped down the sides of a multi-layered cake. It's so pretty. Also, a naked cake does well with bottled as well as from-scratch toppings. When I've been in a screaming hurry, I've topped my cake layers with bottled ice cream fudge sauce. I heated the sauce and thinned it with a little cream, then poured it over my chocolate layers. Then I garnished it with a pile of caramel popcorn. It was stunning and superb. I did the same using a yellow cake and strawberry ice cream topping. I heated the jar of topping and thinned it with a little agave syrup and then poured that over the filled layers. It was very tasty. And the best in-a-hurry naked cake was finished off with a jar of caramel ice cream topping. Again, I heated it through, thinned it with a little cream, and drizzled it all over my filled chocolate cake layers. Oh, and the fillings? If you need to, you can take the same easy-peasy route as you did with the bottled toppings. Instant puddings, which set up quickly, make good fillings. Or, whip softened cream cheese with powdered sugar and fold whipped cream into that, and voila! Perfect filling for any flavored cake. And the easiest filling of all? Canned pie filling. Cherry pie filling is the perfect flavor match for chocolate cake layers. 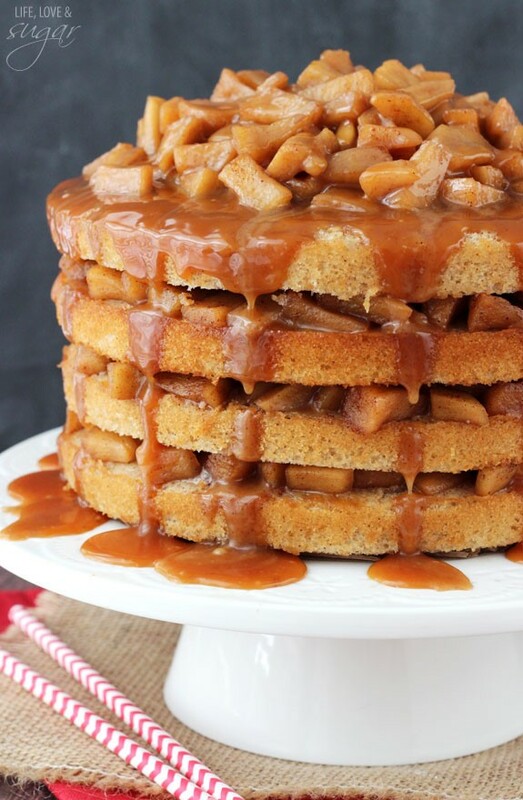 Apple pie filling is pairs well with spice cake layers. And lemon pie filling is scrumptious between yellow or white cake layers. I'll usually use 2 cans of filling-one to divide between the layers and one to drizzle down over the top and sides of the cake. 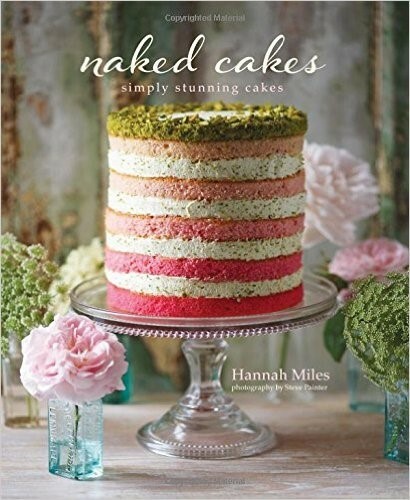 If the idea of a naked cake interests you, then here's just one of many cookbooks on the subject, this one by Hannah Miles (hard cover-new and used from $14 on amazon.com). And take a look at one that came to me from the Kitchenaid folks (I get their newsletter). 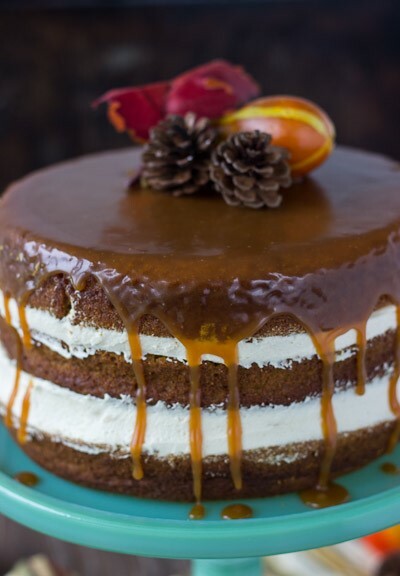 This is a pumpkin cake made from scratch, filled with from-scratch caramel buttercream, and covered in from-scratch caramel sauce. This was work to make, but very worth the time and effort; when you're in the mood to bake, a from-scratch recipe is just what you want. This naked cake might just be your next show-stopper! In a 3.0-quart saucepan, melt sugar over medium high heat. When sugar starts melting, whisk until all the sugar melts. Sugar will clump in whisk but keep whisking. Once all the sugar is melted, stop whisking and let sugar get to a deep amber color. You can swirl the pan to mix. Keep your eye on the caramel, as it will easily burn at this stage. Whisk in the butter and mix until completely melted. Remove pan from heat and gradually add in the heavy cream. Whisk until smooth. Whisk in the sea salt until dissolved (if using). Transfer caramel immediately into a glass jar and let cool completely. Preheat oven to 325°F. Butter and flour three 8-inch round cake pans. Line with parchment rounds and grease parchment. Blend brown sugar and eggs until light and fluffy. Gradually add in vegetable oil and mix until just combined. Beat in pumpkin puree and vanilla extract. Alternate the dry ingredients and milk, in three batches, and beat until combined between each addition. Beat butter on medium high until smooth about 2-3 minutes. Reduce speed to low and add sugar, one cup at a time. Beat until combined. Add vanilla, heavy cream and caramel sauce and beat to combine. Increase speed to medium and beat frosting until smooth and fluffy. Place one layer of cake onto a cake board or plate. Spoon about half of the filling onto cake. Top with second layer of cake and remaining filling. End with the last layer of cake. 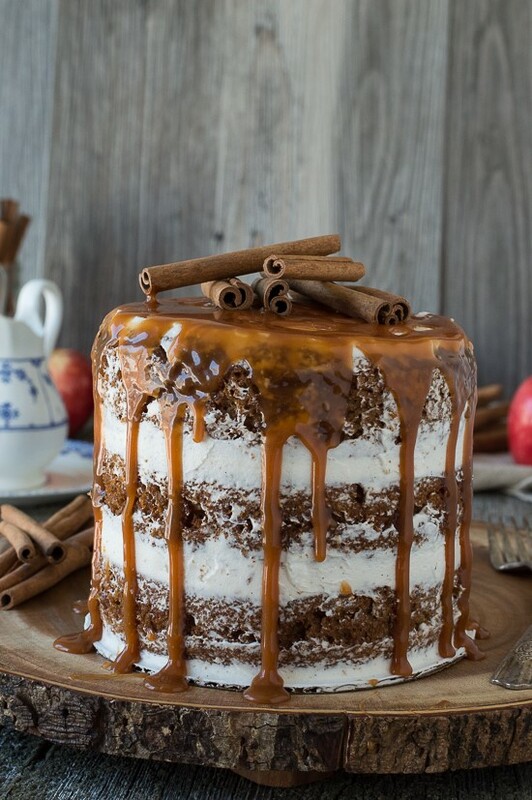 Top cake with caramel sauce.